Well, what did you expect to see here? 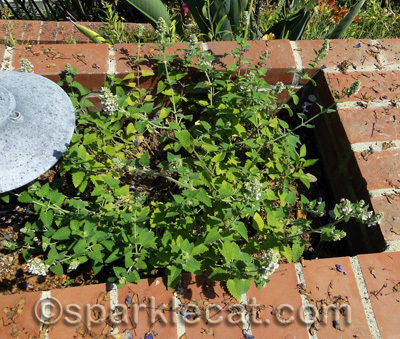 My human is too lame to grow silver vine, but catnip thrives with neglect, apparently. We didn’t have time for an actual nip party this week (just a lot of box treats), but my human found some outtakes from a nip party we had in July, 2012. (Don’t worry, we’ve had lots of nip parties since then.) 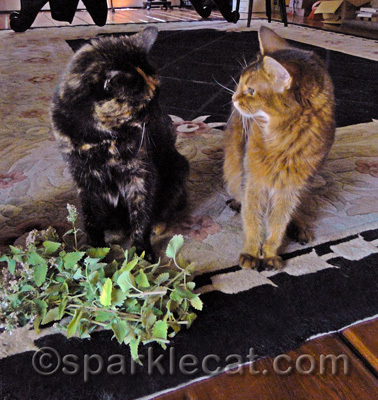 Here are Binga and I debating ownership of this pile of fresh catnip. Here I am, taking in an intoxicating whiff. This is good stuff! Binga is taking a big bite here… but she’s not exactly eating it. What she’s doing is bruising the leaves so that it releases more of the essential oil nepetalactone so she can get higher. 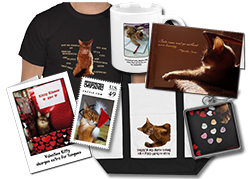 My human learned cats do that when she was working on the Catster story on kitty intoxicants. Now you know too! Binga, you are a smart cookie in the world of intoxicants! We SO agree. this is the ONLY way to observe PhotoHunt: PLANT. Hmmmm been awhile since my cat has had some catnip. Think I may have to buy him some! Nice photos! 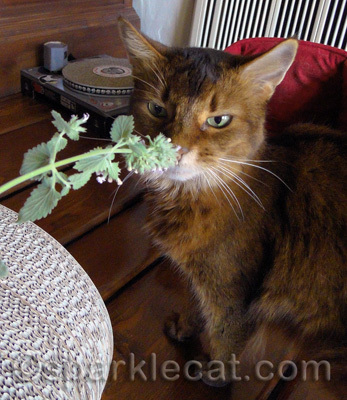 How fun to have homegrown catnip! You are some lucky kitties. You have a good-sized plant growing there. I have a small plant outside but I don’t respond to nip. I like to go by and smell which other neighbor kitties have visited my plant. Glogirly can’t grow anything except refrigerator science experiments. We are very impressed by the huge pile of nip at your nip party. We’re drooling just thinking about it. Mmmmmm…fresh nip is the best. 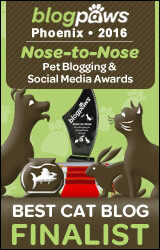 We could have had catnip too, if only Mom planted the darn seeds ! Do you girls get the munchies after a good ‘Nip session? I hope your Human has excellent snacks to offer after you get high. It’s only polite. Sounds like something I could grow. My cats would love some fresh catnip. You are so lucky to have one of those. Y’all sure are lucky to have such a terrific plant!!! Whoa! I didn’t know that last factoid. I like the nip after it’s been dried. I eat it but don’t roll around in it. I bet we could grow the vine somewhere in the USA. I love a bit of nip now and then. But not so much as Ichiro and Gemini. Yummy!!! *slurp* Glad you got the book just fine! Sorry you can’t attend the book launch party, though. Be sure and check out the website afterward, because we’ll be leaving it up for the informational links & videos (and the free poster). Girls! You gave me a great idea! That’s our favorite plant! Great Photo Hunt! I wish my human had green fingers so we could plant Nip !! I wish my human would plant catnip again. But she was told the season to buy a nip plant is spring (of course she is too lazy to grow it herself!). We have never had fresh catnip, only dried. We are going to have to file a Cat Union grievance about this. 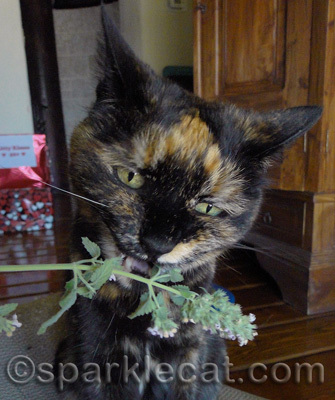 There’s nothing as good as fresh organic catnip! We completely obliterated our nip plants this year. Next year mommy is going to hide it until it’s a good size. Happy Caturday! That is some fine looking nip…I do believe I got a whiff of it all the way over here. Our Catnip plant seems to survive absolutely everything. The cats chew on it, lie on it and it still keeps right on growing. We don’t get very excited about it here in the house though. Weird. Hope you have a great day. That looks like a great pile of nip there – we’ll see you later when you’ve come back down to earth! Enjoy.